We call it kiddush, a ritual of words and drink, a magical bridge from the harried weekday to the day of rest. So enchanted we are by the kiddush that we repeat it again in a different form by day. The kiddush serves as the kickoff for the evening and daytime Shabbat meals. The nighttime kiddush consists of three parts: 1) Three verses from Genesis that recount how G‑d rested on the seventh day and sanctified it. 2) The blessing for wine. 3) A blessing thanking G‑d for giving us the Shabbat. A magical bridge from the harried weekday to the day of restThe daytime kiddush consists of several verses from Exodus, followed by the blessing on wine. On Friday night, sing the Shalom Aleichem, to welcome the Shabbat angels, and the ode to the Woman of Valor. Rinse and dry the kiddush cup. Fill it to the brim with kosher wine. Gather everyone to stand around the Shabbat table. 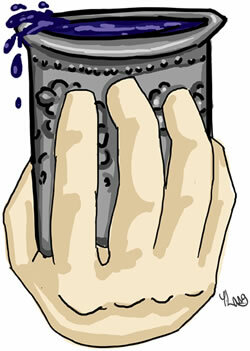 Raise the wine-filled cup in your right hand (unless you are left-handed), and recite the kiddush aloud. On Friday night, gaze at the Shabbat candles as you say the first four words. Then look at the wine in the cup while saying the wine blessing. All in attendance answer “Amen” at the conclusion of the blessings. Drink at least 1½ ounces from the cup. Everyone else should also have a sip. Wine is preferable, but kosher grape juice is okay. Don’t eat or drink before kiddush—starting from sundown of Friday night, and after the prayers on Shabbat morning. If no wine or grape juice is available, recite the kiddush on challah or bread. Just replace the wine blessing with the bread blessing—and wash hands before the kiddush. Once someone has sipped from a cup of wine, the leftover wine should not be used for kiddush unless some fresh wine is added to the cup. Click here for the kiddush texts, and here for recordings of the evening kiddush and daytime kiddush. Re: Blessing The blessings on various foods are listed in the Talmud Berakhot 35a. Very nice! BUT.. Can you add sources to the minutes? at least to the new ones?